I like Isaac’s categorisation by colour. This afternoon after Isaac had been to the loo, like the good boy he is, he dutifully washed his hands. About 20 minutes later I stood at the top of the stairs and noticed he was still standing at the sink in the downstairs loo. But now he had the plug in and had filled it with warm water and fetched a few of his Octonauts toys. “Would you like a bath?” I asked. “Yeah!” he said, quite enthusiastically and moved operations from the downstairs loo to the upstairs family bathroom. Isn’t it just as well we’re an upstairs family. The bath was run and in jumped a very happy Isaac, two Captain Barnacles, one Lieutenant Kwazii, a GUP-B and a GUP-D, and they were off for a proper adventure. None of this paddling around in a sink nonsense! About ten minutes later I noticed that the play had stopped and it was quiet in the bathroom, apart from the gentle lapping of water and the sound of Isaac doing… well something. So I went to investigate. Isaac is taking a real interest in numbers and letters just now. At nursery he now has to literally sign in by writing his own name. 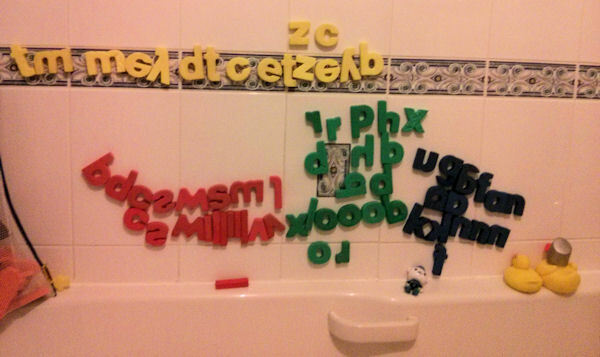 So when I poked my head around the bathroom door I was delighted to see that he had tipped out both tubs of foam letters and was arranging them, by colour, on the tiled wall. That’s my boy! We’ll make an information architect out of him! I can’t quite decide, though, if the two ducks (one has a knight’s helmet on, by the way) are watching what’s going on or being punished and told to look at the wall. Is this the last alphabet that English will ever have? I wasn’t great at English at high school. I just didn’t connect with it, and none of my teachers really set my heart on fire with passion for this odd, largely-stolen language of ours. That was until I went to university in 1989 and had to learn another language: biblical Hebrew. In order to learn that I needed to brush up on my understanding of language, grammar and syntax. 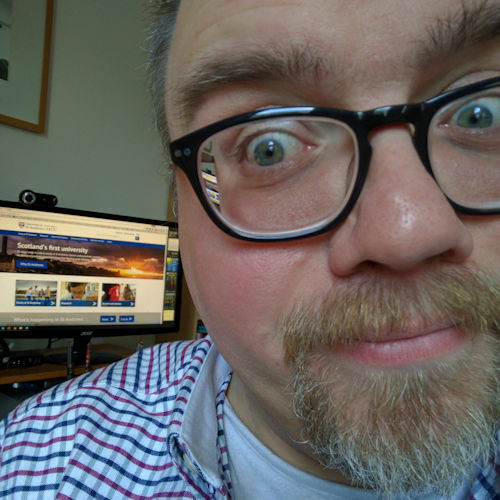 Thanks to Dr Jim Martin, Dr Robin Salters and Mr Peter Coxon for the first time in my life I began to feel excited about language. I studied Hebrew (3 years) and Greek (1 year) and after I’d graduated I had a rather failed attempt at trying to learn Scottish Gaelic and I began to read more about English, its grammar and history. I rather enjoyed this three minute video by Tom Scott about the English alphabet. I have often wished that we still had a few of these characters in our alphabet, not least because then my name might have been spelled Garð. Posted on Friday 14 February 2014 Thursday 14 December 2017 Categories GeneralTags alphabet, English, language, video, YouTubeLeave a comment on Is this the last alphabet that English will ever have?